The results are in and my there are a lot of them. We’ve taken our time to carefully review how you’ve answered. To a joint sigh of relief from Alan and I we can see that overall what we’re producing you like. You have given us some excellent ideas and suggestions for future content too. I wanted to address replies, but fear not this is not a question by question analysis. However, if you will indulge me, I will specifically look at a few questions as they warrant a detailed response, after all you took the time to tell fill the questionnaire out! 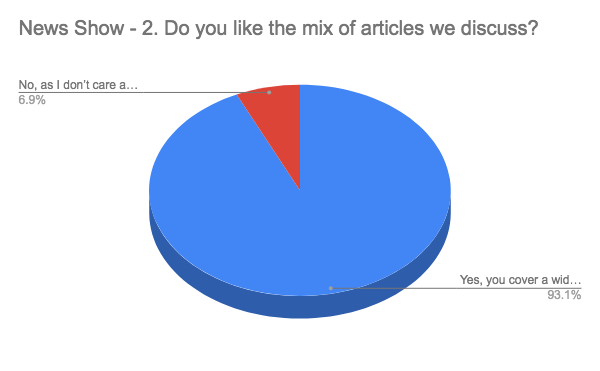 Whilst most of you are happy with the overall mix of articles in the show, more detail was provided. The monthly SMMT New Car Registration figures do not require the line by line analysis we were giving them. You will, hopefully, have noticed we don’t spend as much time on this now. When we know of absences, ahead of time, we will do our best to have a guest join us. We cannot guarantee this will always happen, but we understand most prefer to hear at least two voices discussing the news. We are pleased that you like our style of car review, although there is an even split between those who think they’re too long and those who think they’re too short. Possibly we’ve got them just right then. You have given us some great suggestions when it comes to cars to cover. We are working on bringing you more variety in manufacturers, size and type. Hopefully, you’ve begun to see results of our efforts on that front. Talking of fabulous suggestions, the ideas for Round Table episodes are brilliant. Again, we are pleased that what we have been trying to arrange is along the lines of your thoughts. For example, you seemed to like our previous road-trip almost as much as we did. This will require several sessions in our meeting space, or “pub” as you may know it by, to organise. One response we received caused a slap-head-with-hand moment, where we were asked to add more female voices to the shows. We are now working on correcting this oversight. 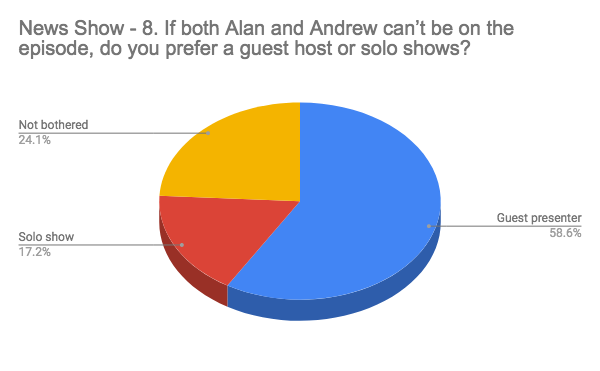 If you want to suggest who you would like to appear on the show, do let us know and we’ll approach them. Hopefully you can see that we have taken your responses seriously thank you for taking the time to complete the questionnaire, we will be tightening the editing, reducing the spreadsheets and adding different voices to the shows. I will still write the show notes though.